Expedition however the PYO first basic mountaineering training camp for young school boys and girls was very successful. Since Karakorum has different weather conditions, the winter arrives late November in the high mountains of Karakorum, according to the calendar year it has been said that December climbing expeditions are not a full calendar year expedition. 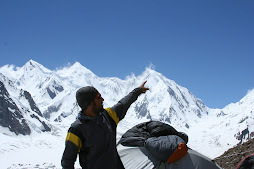 However a few years back the Alpine club of Pakistan organized a climbing expedition to Peer Peak in the Karakorum which was named “Winter Expedition”. Similarly there was another expedition in November by locals which was also named Winter Expedition. Looking at the extreme weather situation in the high mountains, December and January is normally considered winter in the Karakorum, Pamir area hence the expedition is also Winter Expedition. 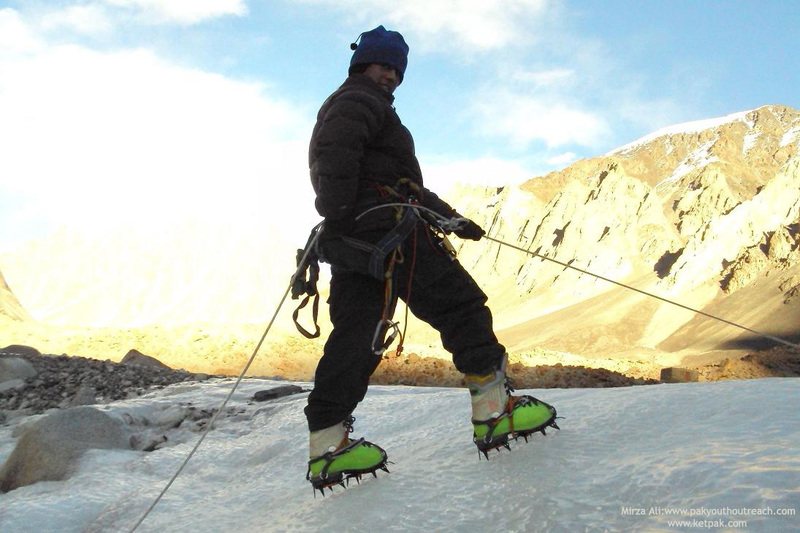 Yausaf Khan, former army climber as our expedition advisor. The first day was spent at Korband. During the winter days are short and most streams at different summer camp sites get frozen therefore the first night spent at Korband was pretty chilly and there was a lot of frost in the tents. After a steep climb of Ghar Sar the next day the team managed to reach Uch Forzeen in 9 hours, the chill was great though the day was sunny. Uch Forzeen provided us with good shelter for cooking in the hut but sleeping in the tent was pretty hard, at midnight I found my sleeping bag frosty and frozen half due to my breathing but a great adventure all the same! Uch Forzeen to Arbon Purian was a nice journey, the frozen slopes of Arbon Purian were nice for practice and play adventure in the cold climate. It was longer in the winter from Arbob Purian to Shujrave where we set our base camp, the cold was great, it took us four days to reach Shujrave which is normally three days walking in summer. After two days of acclimatization and practice in Shujrave, Samina and Jennifer Rawlings (guest climber from Atlanta, Georgia, US) made it to the pass, the previous day, unfortunately Jennifer Rawlins got sick. Jennifer came to take part in this historical adventure and she believed it was a wonderful experience but truly cold! We marched up to high camp, Samina, Yausaf and Mr Tafat Shah, PYO Trainer, also Mr Yahya Baig and myself Mirza Ali, Expedition leader and Wazir Baig were the climbers in the team. Samina Baig first Pakistani woman on winter expedition in the karakorum. Samina Baig photograph just 150m short from the summit. photo taken at approximately 5900m. The high camp was settled at approximately 5520m, the night was terribly cold and Yahya and Wazir got sick in the night, however Samina was the first woman from Pakistan to experience such extreme and freezing temperatures at High Camp. The sleeping bag was icy in the morning, the weather was very pleasant but again very cold. Next morning we started our summit push at 8am, the stones were frozen and frosty, the chill factor was high but the sun did come out to favor us at the beginning. After three hours walk we reached below the glacier, changed our climbing shoes and dressed up for the next stage of the expedition. The snow was drifting and the upper layers were pretty frozen but it was complete sugar type beneath the upper layer. The climb was pretty tough going from the beginning, the layers start breaking and it was hard for all of us. 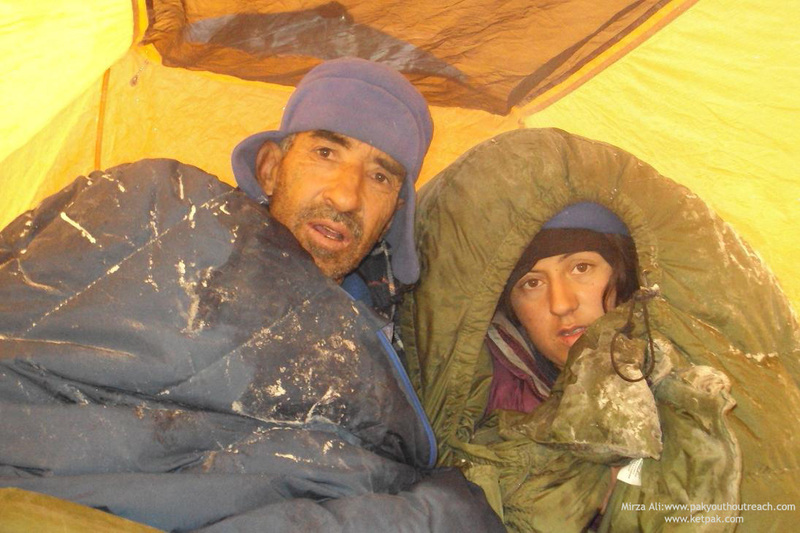 Wazir was ill and returned half way, we climbed for another two hours when the wind and weather became very cold. 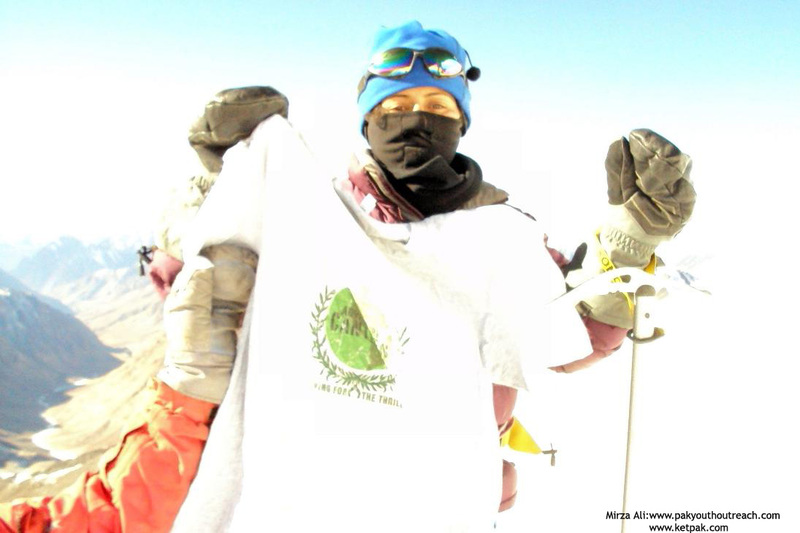 Samina had a down jacket with no hood and this was not suitable protection for the extreme cold weather, the pants were not even down so that made it difficult to continue to the summit. We reached approximately 5900m, just 150m short of the summit, the time was running out so we decided to return since it was a step forward in progress and we naturally wanted to return home safely! samina baig and Yausaf Khan looking at the summit 150m away! During the climb I noticed my video camera battery got dislodgedi was unable to make more video of the climb and i was not adapted with still setting of ISO,which also make bad pictures in the bright light, later jennifer helped me to set ISO setting on the way back to base camp. 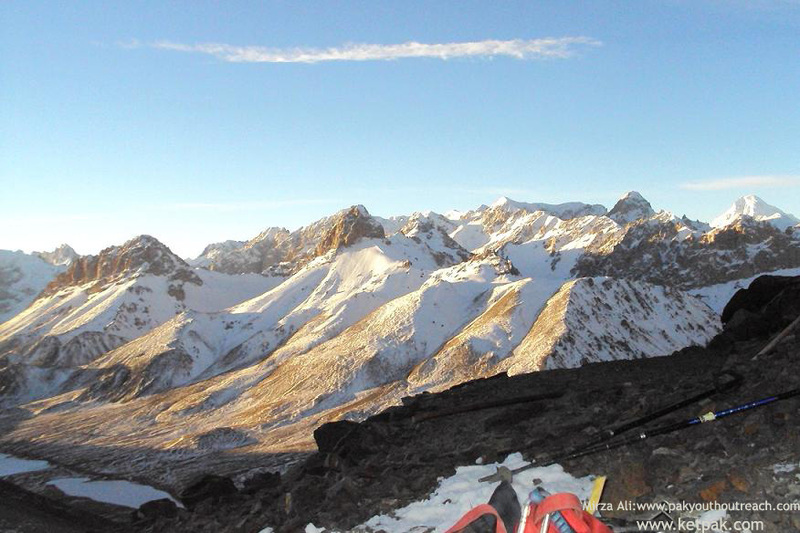 The descent was arduous, the long ridge descent was tiring but we finally made to the High Camp. The wind was extremely strong and was to blow our tents off from the ridge, after preparing tea Samina and Yausaf left straight for Base Camp. We packed our belongings and tents to follow. Jennifer and Gul were down at the pass, we had planned to fix another high camp at Quz Sar after a successful attempt of Mingligh however it was not really achievable since other members were tired. We met them down in the evening it was then decided to have some rest and then move back to Quz Sar approximately 5900m and climbed an unnamed peak. 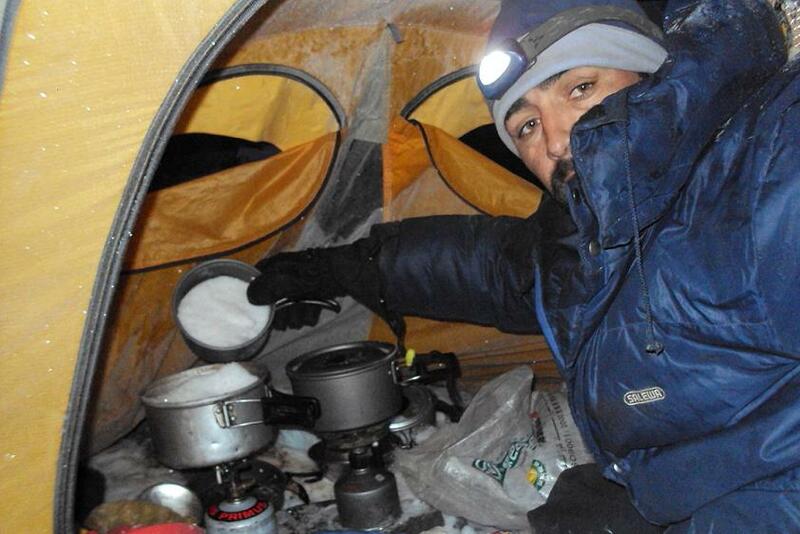 We reached base camp as the dusk was all around, Imran our “cook” welcomed us and served the meal. The night was cold and chills were looming, in the morning it was very cloudy and started snowing. We consulted Yausaf and Tafat the experienced climbers who then decided to call off the expedition, hence all packed, we left for Shimshal. This expedition was an initiative for the youth and women of Pakistan to enter into extreme sports such as mountaineering, it was a myth breaking expedition for Pakistani women and youths whatever the outcome. Reaching the summit is the exception in the mountains; most renowned mountaineers find that the “fail summit ratio” is higher than success. When I took the decision to return 150m short of the summit, the Sir Edmund Hillary quote was the basis that he used for Everest mostly to avoid any chance of accidents. It was the right decision to go home safely since mountains never go away! Right after the expedition, Pakistan Youth Outreach conducted a Basic Mountaineering School for boys and girls in Shimshal at Malangutti Glacier, the participants were from different schools. Among the participants there were Bibi Numa (10th Grade), Shumaila Biag (10th Grade), Mudasir Pannah (9th Grade) , Nargis Murtaza (9th Grade), Shah Dualat (5th Grade) ,Afsana Tafat (6th Grade), Muhammad Habib (4th Grade), Arshad Karim and Samina Baig. The training was overseen by Mr Yausaf Khan former Pakistan Army climber and Mr Tafat Shah the best technical and experienced mountaineer, myself as PYO Founding President also supervised the training. Jennifer Rawlins Youth Outreaches main supporter was also on the training. The kids enjoyed the outdoor and the basics of mountaineering and wanted similar training for them in the future. The PYO’s objective is to encourage youth and women’s outdoor and adventure activities and spread this across Pakistan and world to bring a peaceful and healthy environment for youths and also encourage nature studies and research work on high mountain settlements and glaciers as well as study tours as part of recreation for fresh mind for studies! donations. 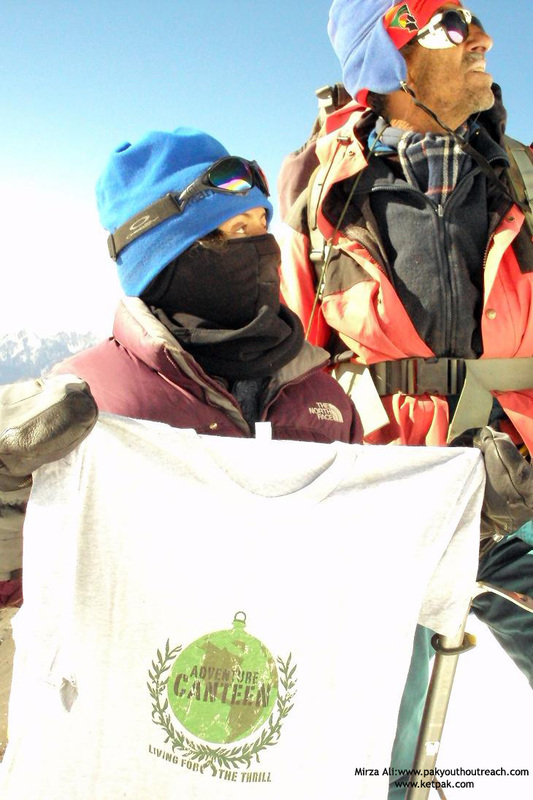 We thank Jennifer Rawlins “for coming to Pakistan in the extreme weather condition and becoming part of the team and giving a positive image to other women around the world showing that Pakistan is safe and secure as well as welcoming every folk to enjoy a Karakorum adventure”. We also thank Carol Anne Grayson for her support and article and hope to share much more in the near future about our projects. We also appreciate those individuals who sent their personal donations! We are here just because of you people and your support and hope to have your support in the future as well to make PYO objectives possible! Thank you ALL! Interested people can join us on our future trainings on mixed or purely female expeditions to virgin and other mountains in the Karakorum!